(Cynara scolymus) Abdominal Pain, Appetite, Bile, Cholesterol, Constipation, Digestion, Dyspepsia, Flatulence, Gallstones, digestion, Liver, Nausea / abdominal cramps, triglycerides, diabetes. Promotes bile production to cleanse the liver and gall bladder, lowers blood lipids and cholesterol, helps prevent constipation, and is a strong antioxidant for the liver. 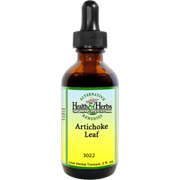 Artichoke Leaf is an antioxidant, hepatic, and blood cleanser. WARNING: Do not take if you have gall stones or bile duct occlusion. Artichoke Leaf, R/O Water, 12% Alcohol. Artichoke Leaf is shipped in a discrete, unmarked package. Orders are processed immediately and usually take about 3 to 5 working days to be received. Any information received is used only for order processing and shipping purposes. Your information, such as e-mail address, will never be disclosed to a third party.